Dr. Courtney Ridley was awarded her Doctorate of Audiology (Au.D.) degree from the University of Florida in May 2018. She received her Bachelor of Science in Education from the University of Georgia in May 2014. 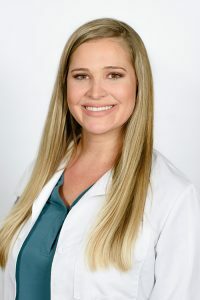 Dr. Ridley completed her clinical residency at Mayo Clinic Florida in Jacksonville where she obtained valuable experience in vestibular evaluation and rehabilitation, diagnostic testing, cochlear implants, and hearing aids. Additionally, Dr. Ridley is trained in the areas of comprehensive audiological evaluations for patients of all ages, advanced hearing technology, osseointegrated (bone-anchored) hearing devices, tinnitus evaluation and treatment, electrophysiology (including electrocochleography, vestibular evoked myogenic potentials, and auditory brainstem response), videonystagmography, canalith repositioning maneuvers, and rotational chair assessments. Dr. Ridley is a licensed audiologist in the state of Florida and holds a Certificate of Clinical Competence in Audiology (CCC-A) from the American Speech-Language-Hearing Association (ASHA) and is a fellow of the American Academy of Audiology (F-AAA).